I first read about Heinrichs in a Bloomberg Businessweek piece on him. He’s quite a character, with high profile clients like Ogilvy & Mather and the Pentagon. 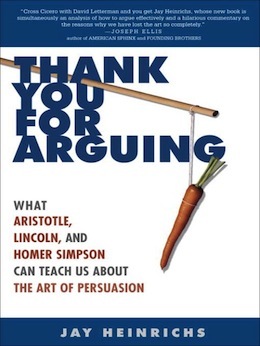 Struck by some of his ideas, I decided to pickup Thank You for Arguing. Compiled into 25 very readable chapters, Heinrichs illustrates how to win trust through managing your voice with volume control for positive affect, verbal jousting and calling fouls, and mastering timing. Sure in the real world this is all going to require a lot of trial and error, and practice in the trenches. But his book serves as a very good guide along the way. Don’t worry too much about Aristotle, Cicero or the classics you never learned in school. If anything they serve as a colorful highlight to his useful everyday illustrations. 1. Have a disagreement at a meeting? Diffuse it with “let’s tweak it”. Rhetoric indeed. I’ll be studying this book for months to come!